Who doesn’t want to be a millionaire? While most workers only “dream” of this type of success, best-selling author and performance expert Noah St. John has a step-by-step approach to help people make this—and other life goals—a reality. Through his The Book of AFFORMATIONS, St. John offers readers insights and steps to use the process of AFFORMATIONS, empowering questions that change one’s beliefs about him and herself and his and her relationship to the universe, to achieve health, wealth, love and happiness. 1. One focus of your book is wealth. 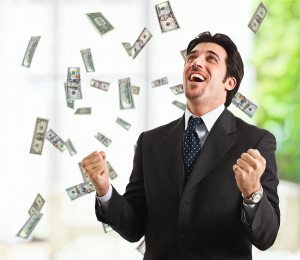 Is wealth important to be happy? Why or why not? Growing up poor in a rich neighborhood, I got to see first-hand the dichotomy between the haves – which was everyone around us – and the have-nots, which was my family. That was the first time I realized that there is nothing good about being broke. Having wealth gives you choices, and it is the choices that make you happy, not the money itself. For example, a recent survey showed that less than 38 percent of Americans are happy in their jobs. That means that most people are working in jobs they don’t like because they believe they don’t have the option to do what they really want. That’s one of the reasons we empower our clients to have more choices in life, and having wealth is one of those choices. 2. I’m sure we’ve all watched the TV show Who Wants to be a Millionaire? and have dreamed of becoming that wealthy someday. You actually offer helpful information needed for people to reach this goal. What are the five power habits of multi-millionaires? 1. Take 100 percent responsibility for your choices. 3. Have a great support system. 5. Give yourself permission to succeed. 3. How can one think like a millionaire in less than five minutes per day? When you start following the 4-step Afformations Method I give you in my book, you’ll start to become aware of the disempowering questions you’ve been asking yourself, like Why can’t I do anything right? or How come there’s always more MONTH left at the end of the MONEY? Then, as you start to replace your disempowering questions with empowering Afformations, you’ll realize that it doesn’t have to be hard or confusing. That’s one reason that countless people have written to me on our Facebook page saying that once they started using Afformations for just a few minutes a day, the changes were immediate and long-lasting. For example, I was on a radio show recently when a woman called in and said that her mother-in-law was suing her for custody of her small children, and that this lawsuit had been going on for months. I gave her some examples of Afformations she could use to help the situation. The next day, the woman wrote to me and said that her mother-in-law had contacted her out of the blue and said that she was dropping the lawsuit! By the way, thinking like a millionaire doesn’t mean that you start using Afformations and a million dollars magically appears in your bank account. It doesn’t work that way. This isn’t magic, it’s science. The point is that most people are asking themselves disempowering questions and living a life they don’t want. Using Afformations will help you focus on what’s RIGHT with you, rather than what’s WRONG with you. Studies have shown that while the conscious mind can hold only a few ideas at a time, your subconscious mind can hold many more. That’s why you can never really overwhelm your subconscious mind. Think about it this way: How many negative thoughts have you had about yourself in your lifetime? A billion? A trillion? Most of us could hardly count the number of negative thoughts we’ve had about ourselves. When you think these things, you’re effectively “listening” to these negative thoughts in your head. That’s one reason we encourage our clients to not just read their Afformations, but also say them and listen to them using iAfform Audios. And that’s why for a limited time we’re giving away free downloadable iAfform Audios when you buy The Book of Afformations at www.Afformationsbook.com/more.